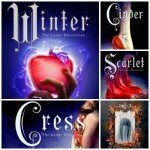 This review is about the entire series, which consists of, in order, Cinder, Scarlet, Cress, Fairest, and Winter. (There is a collection of short stories that is kind of a side part of the series, Stars Above, that I haven’t read yet, but the stories are prequels and an epilogue to the rest of the books.) 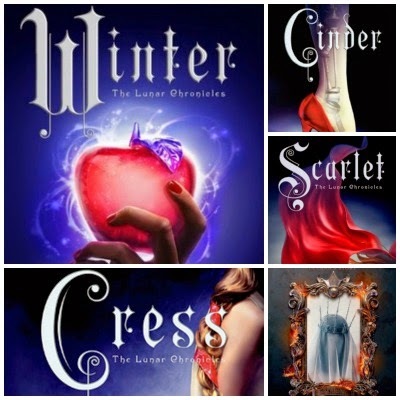 Each book is modeled after a different fairy tale–Cinderella, Little Red Riding Hood, Rapunzel, and Snow White, respectively–but they all tell the same overarching story that begins in Cinder. I really loved this series. The way the author adapts the different fairy tales to a dystopian science-fiction story involving moon colonization and cyborgs is seamless and clever. The nods to the original stories are subtle and never pulled me out of the story, and the characters are far more than fairy tale stand-ins. There is a richness to the world-building especially–I want to learn more about the history of how our version of Earth becomes the version in this series–but also in terms of theme. 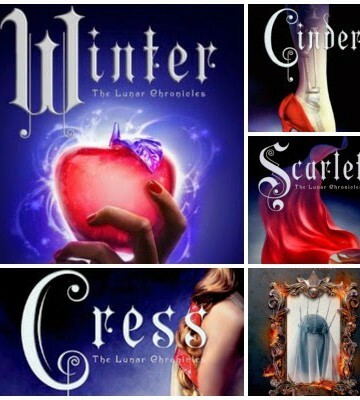 Just the fact that all of the books are titled after the woman each book is focused on, except for Fairest, which contains Levana’s backstory, is incredibly telling. (And I love how Fairest creates such a complex character in Levana, without demanding that we pity her, and without using her experiences to justify her actions. Someone can be mistreated and take responsibility for her actions–and make better choices–and the series overall takes that position. I think that is far more complex than a lot of other “villain’s point of view” books, which I feel tend to excuse the villain’s actions.) Despite the large cast of characters–many of whom are protagonists in their own rights–and how much is going on in terms of plot, none of the books feel bloated. In fact, I actually found the writing to be pretty effective, and the pacing works really well. There could be a little more subtext, but that is a personal preference, and there is already a lot of symbolism. If you’re looking for female-led science-fiction (SO MANY FEMALE CHARACTERS) with PoC characters, read this series. This is a series I would have loved in 4th or 5th grade, when I started reading more science-fiction and had a hard time finding books in the genre that were about women (and that also appealed to a kid that age). This is another series that could be used in a unit on fairy tale/folk tale/mythology adaptations, or in a sci-fi unit in general. There’s a lot in the books about what it means to be human, and what constitutes a person–in dealing with androids, cyborgs, genetically-engineered human/animal hybrids, and illusions–which would be great to explore with a class. Students could also study the books from a political/world building perspective. All of these books are middle school appropriate. Parts would be too scary for younger readers, but I think 4th/5th grade and up would be perfect. My 6th graders LOVE this series.